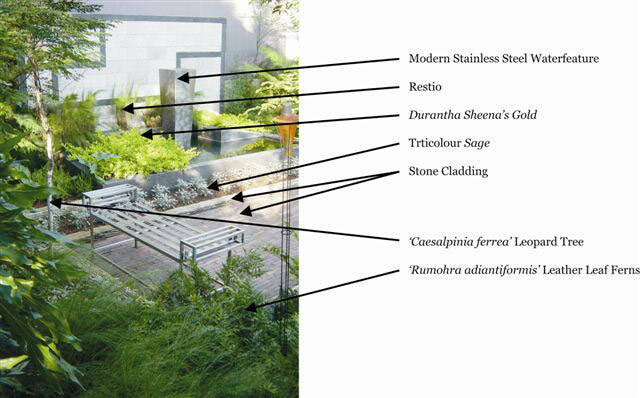 A modern patio garden uses a striking raised black pond as a central focal point. The stone patio laid in a parquet style adds a refined look and the use of stainless steel on the pond edges create dramatic reflections in the water. The water feature is a still pond with a single pot that appears to float in the centre, with water silently flowing down the sides. The pattern of the pond is repeated as the pattern of the garden and feature wall giving a sense of unity throughout and representing a triptych work of art. Fine textured block planting of indigenous ferns, ground covers and other perennials soften the geometry of the design, yet also strengthens the lines. Shrubs & Perennials: Freylinia tropica, Asparagus virgatus, Rumohra adiantiformis, Calopsis paniculata, Durantha Sheena’s Gold. Groundcovers: Stachys flexuosa, Sagina subulata ‘Aurea’. Annuals and bulbs: Scilla natalensis, Lachenalia ‘Rosebeth’.